At Eastchurch Primary School we know good attendance is the key to successful schooling. Regardless of the reason, if your child is absent from school it will impact on their learning. Attending school regularly gives your child the best possible start in life. It enables them to keep up with their learning and form good habits in preparation for the future. It is the responsibility of parents and carers to ensure their child goes to school regularly and arrives on time. It is important to be punctual as persistent lateness can be counted as unauthorised absence. Arriving late to school is unsettling for children and means they miss key information and important at the beginning of lessons. Being on time shows a pupil is ready and willing to work as well as developing a sense of responsibility and forming good habits. Children will be welcomed in to school from 8.30am but MUST be in school by 9.00am. 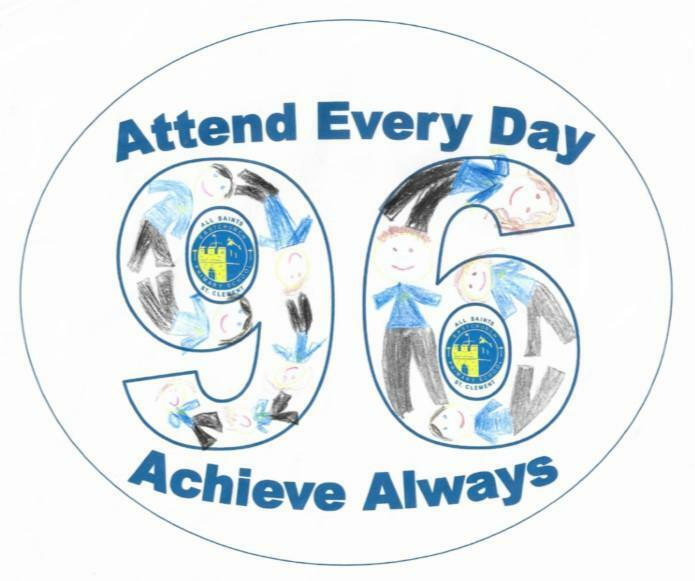 To help raise attendance we have launched Project 96 with the support of our Local Authority School Liaison Officer. The aim of this project is to ensure that every child is achieving at least 96% attendance. Any child with less than 96% may be involved in the project. It is our aim to work with families to ensure all children's attendance will improve. To launch our project we invited our children to design a logo or create a strapline to highlight our campaign. Eli, St Clement and Harvey, All Saints, produced the winning entries which have inspired the final logo.